This year, I opted for History Odyssey Ancients for F&B for history. I wanted to start back at the beginning, and it was in my best interests to do the same topic with both kids, since they are usually more interested in whatever it is the other one is doing. Ben has now developed a fascination with Mesopotamia! 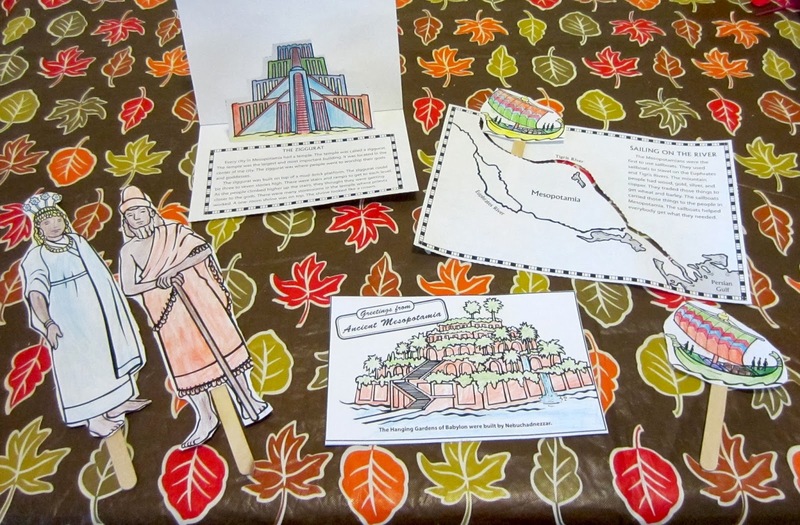 We've been using the Evan Moor History Pockets: Ancient Civilizations to go along with our Pandia Press Ancients Curriculum, and it has a ton of awesome hands-on activities for my third grader. So far, Ben has made Mesopotamia puppets, an interactive Tigris & Euphrates river valley, a ziggurat pop-up book, and designed and written a postcard from Mesopotamia. He's added ziggurat, flax, cuneiform, Hamurabi, and city-state to his vocabulary, along with the place names (including Babylon). He also loved this video from National Geographic. I wish we could find more Mesopotamia for kids movies. It can't only be Ben that loves it!